For a hitchhiker, he wasn’t traveling light. 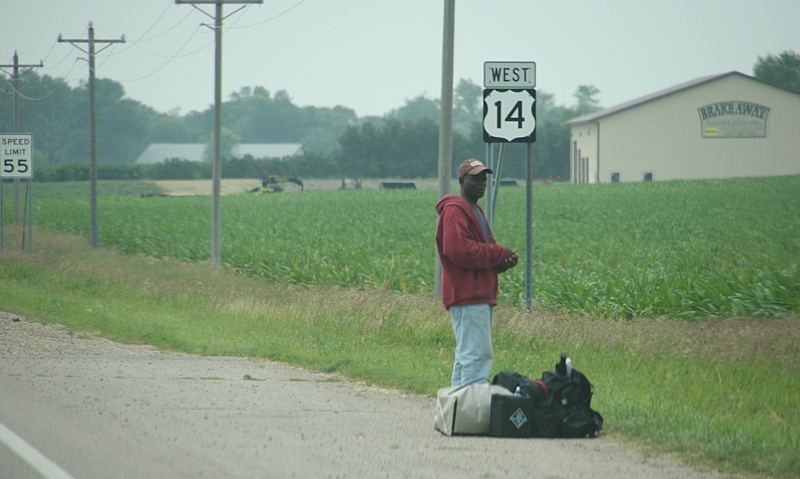 A pile of bags, rather than a single backpack, rested at his feet along a rural highway. Years ago, I would have thought nothing of a person thumbing a ride. But today and in the middle of southwestern Minnesota farm country? Yeah, I wondered. I wondered about his story, about what and whom he’d left behind to hit the road, westward ho along U.S. Highway 14, the Laura Ingalls Wilder Historic Highway. Where was he headed on the afternoon of July Fourth as he waited near the intersection of U.S. Highways 14 and 71, known to locals as Sanborn Corners? Minnesota Faces is featured every Friday on Minnesota Prairie Roots.